Students typically arrive in my chemistry class with little understanding of light. 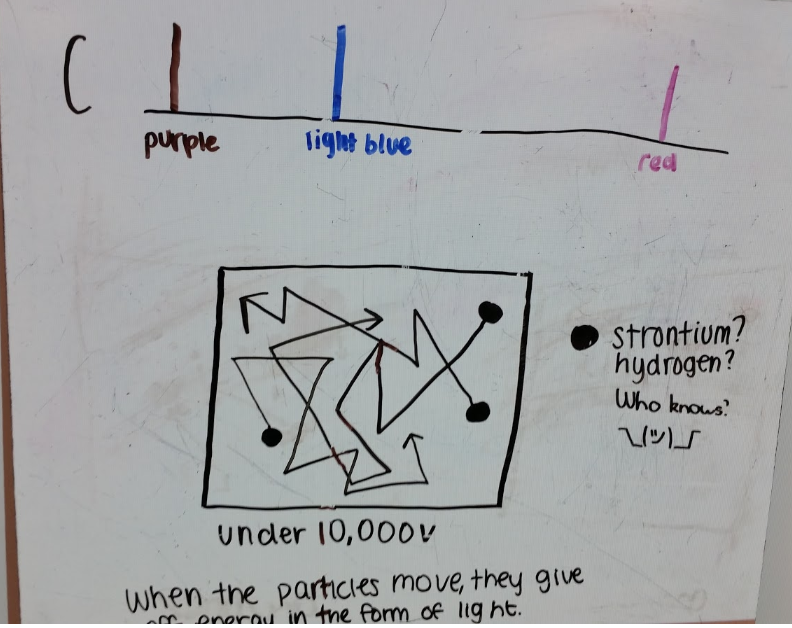 In spite of focusing on particle representations throughout the year students routinely struggle immensely with drawing particle representations of hydrogen particles emitting four colors of light while 10,000 volts are put across the hydrogen spectral tube. I teach using the AMTA modeling curriculum for units 1-9. 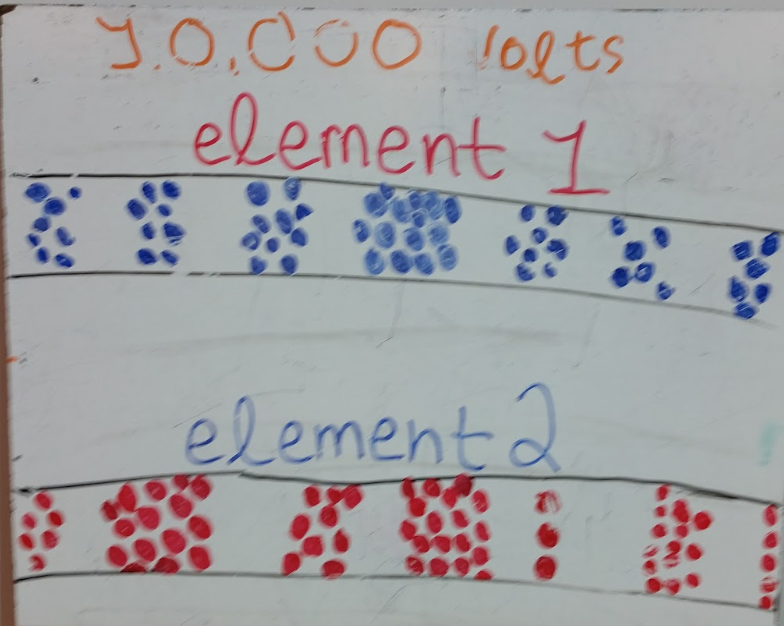 I have modified the 10th unit that focuses on atomic structure and light. I shared my alternative approach to this content using a series of activites on my personal blog in April 2016. I begin with Activity 1 as seen below. 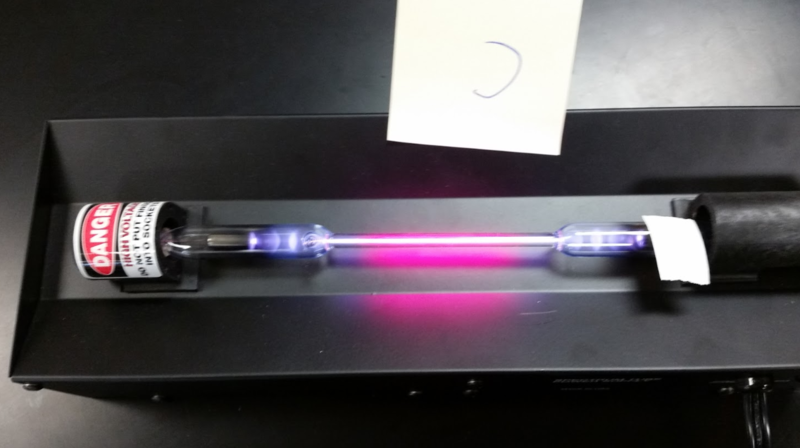 This introductory task instructed students to make a particle diagram representation of spectral tube C (hydrogen, see Figure 2 below) while the power supply is turned on. 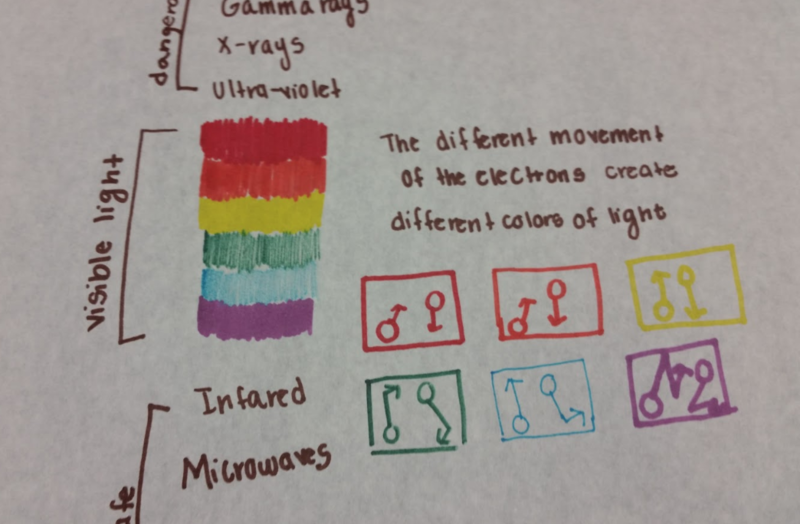 The diagrams should make an attempt to explain why only certain colors of light were emitted and why different elements produce different colors. The hydrogen particles emit 4 colors when the 10,000 volts are applied across the hydrogen spectral tube. Figure 2 - Hydrogen gas while 10,000 volts are applied. Figure 3 shows particles in motion and says the particles give off light. There is no mechanism shown for how this happens, no electrons are included with the particles and no light is shown. The description uses energy to avoid making deeper connections. Figure 4 shows different colored hydrogen particles as well as light from some external source bouncing off of the box. No electrons are included and the light is represented as an arrow but it is not clear if the black arrows on the particles indicate light or motion or both. The light is also not clear if it directly comes from the particles. Figure 5 shows two different elements emitting two different colors of light. 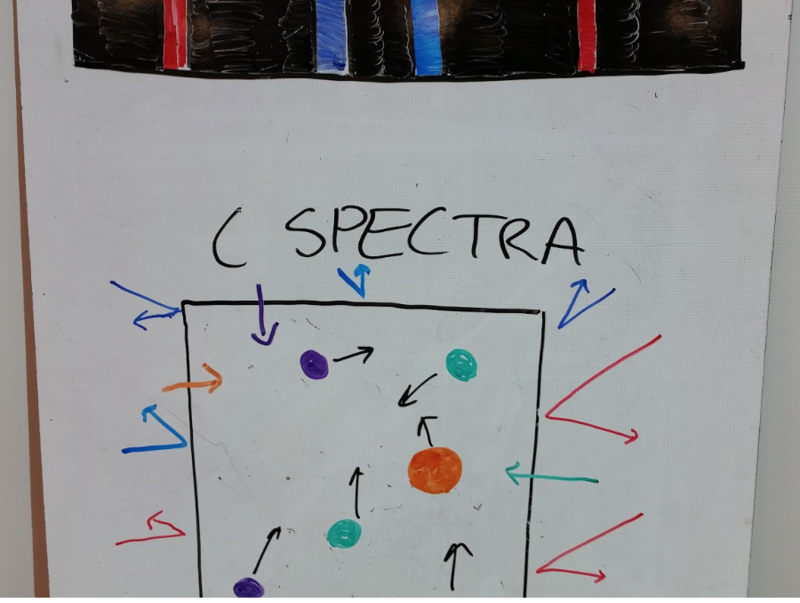 Element 1 has particles bunched into groups and the students explained that one of the elements had a higher frequency in their grouping causing the different colors of light. The light is represented by the color of particle and no electrons are shown. 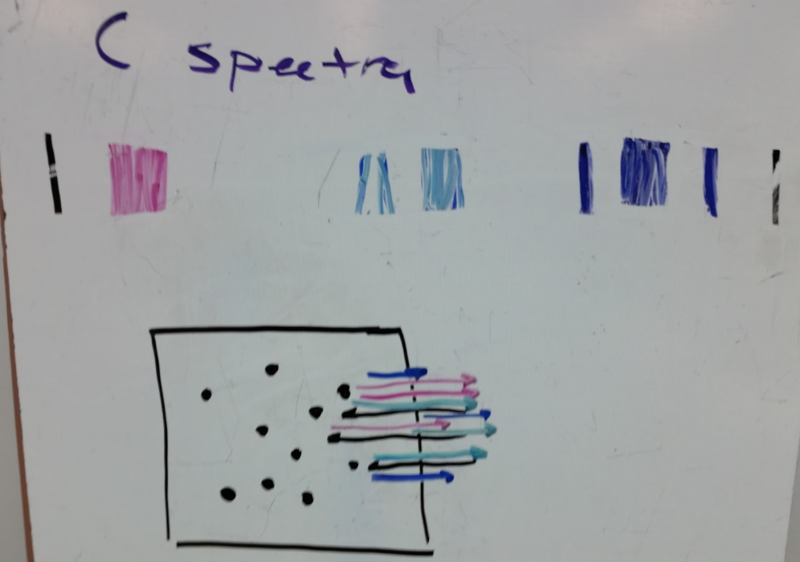 Figure 6 shows particles emitting light where individual particles produce multiple colors. Nothing in the sketch shows why different colors emerge from the particles nor how the light is produced. No electrons are shown and no motion of particles is indicated. This is a particle representation of the experiment with no consideration of the mechanisms by which everything happens. In all of these and other student representations some themes emerge. 1. The students do not know what light is. They know that different colors of light are different but not how they differ. Only one board addresses this (Figure 4) and their attempt has some issues. Some treat light as a wave but it’s often a standing wave representation they likely saw in a textbook or on a worksheet. 2. The students do not know how light and matter interact. The boards show light appearing without explanation of how. Figure 6 shows light coming from the particles, Figure 4 shows light originating externally and both Figures 3 and 5 do not show light in their particle representations. 3. The students do not include electrons in their representations. 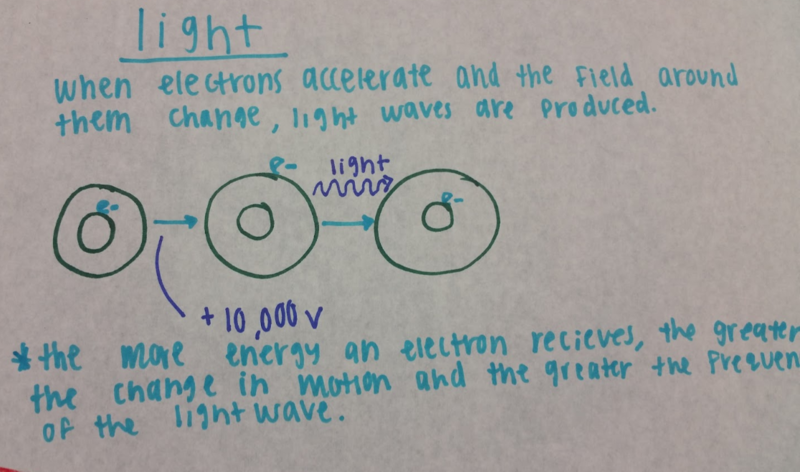 Students are familiar with the Bohr model but do not connect charge with light. It is unclear what they have learned about for the relevance of the Bohr model at this point. It is likely that students are experiencing cognitive overload. They have sufficient understanding of the task but do not have sufficient knowledge about light to give reasonable explanations. To alleviate this I propose that electrons move within atoms and that when the electron changes how it moves light is either absorbed or emitted. In order to address the issues that students have with building functional models I start students with a set of four questions that are central to our learning. I have found that these four questions guide the learning where students develop strong understanding of light mechanisms. What is the composition of light? How do light and atoms interact? How are different types of light different? We then begin to add in new phenomena, discussion and explanation until students have a satisfactory model to describe the initial experiment with the hydrogen spectral emission. Then I use the Electric Field Hockey simulation from PhET with my students. This allows me to define light as a propagating electric field disturbance (question 1). I show students the simulation with the field representation turned on and ask them to talk about what happens when I shake or accelerate one of the charged particles (question 2). The disturbance in the electric field that results from accelerating a charged particle is what we call light. At this point I also like to show students the difference between a standing wave and a wave pulse using a long slinky. They are familiar with the standing wave, but it is very difficult for them to connect standing waves to the models we are going to develop. I push them to identify a standing wave as a series of wave pulses that interfere to produce the standing wave. 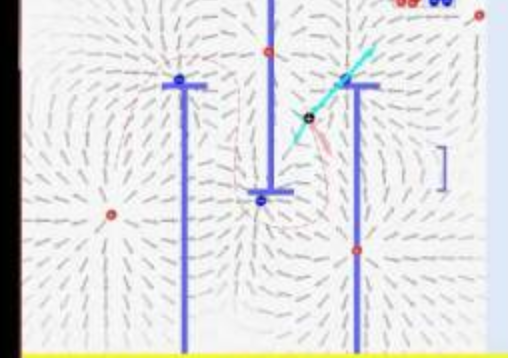 The field hockey simulation gives us a great model of light, light is the disturbance in the electric field that originates when a charged particle accelerates. For students we simplify this to light happens when an electron shakes or changes its motion. That change in electric field will propagate away from the original electron and can influence other electrons that the light wave encounters. When the light wave hits a new electron the new electron will be influenced by the light. A bigger acceleration for the initial electron causes a bigger acceleration for the second electron (question 4). This brings us back to our original exercise. If light results from charged particles changing how they move, what does it mean that hydrogen particles only product four colors of light? Some students will articulate that the electrons of the hydrogen must only make certain changes in motion and not others. This is a very surprising result that needs some time to fully comprehend. When hydrogen has electricity pass through the electrons will only change motion in quantized changes. Now is a good time to introduce two things, the Bohr model and the fact that we cannot see electrons in the same manner that we see macroscopic objects. The Bohr model is a good way for us to depict changes in motion and it is helpful to emphasize that we cannot watch an electron travel around an atom and so we do not know exactly how it is moving. We can predict the motion using mathematical equations but we never can watch the electron in motion without altering its path and even then is it not the same as continuous light being used to track an object. So when we draw a Bohr model we are not stating the electron to move in a circle, rather the circle represents some particular state and style of motion that we do not know completely what the motion is. One of my favorite light demonstrations (see "Colorful Spheres Demonstration" YouTube video in supporting information) ties all of this information together. I pass out a red sphere, an orange sphere, a blue sphere and a violet sphere to four students. I ask for the red sphere to be gently thrown to me. When the red sphere is thrown I fail to catch it and the sphere continues along its path. Then I ask for the orange sphere and this one I catch. While catching or absorbing the orange photon I stand on a chair. When I throw the orange sphere away in a random direction I change back to standing on the ground. The blue sphere I catch and move to the table. When the blue sphere is absorbed the sphere is hidden from view as it is now a part of my new state of motion. When I return to the ground I send the blue sphere in a random direction. The violet sphere causes me to move to a book atop the table. We note that the levels become progressively closer as we change to higher states of motion. We conclude by talking about what the change in height actually represents for the electrons absorbing light. The electron is moving in some manner, then as the electron absorbs the light the electron accelerates into a new state of motion. When the electron emits the light it accelerates back to the original state of motion. 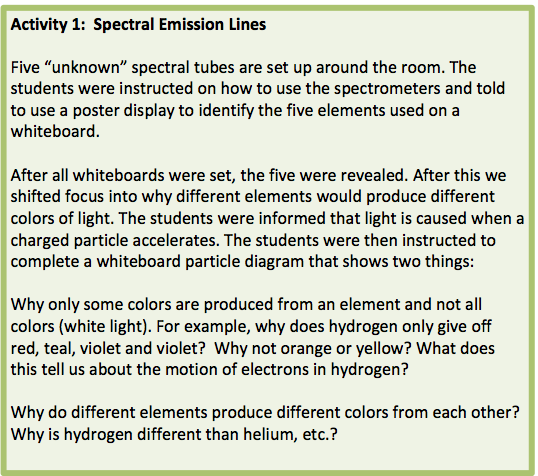 By describing light origins using electron motion, we set up the teaching of electron configurations. Electron configurations are mathematical descriptions of electron position and motion within an atom. We can give a framework for what an orbital is that is approachable for a high school student without sacrificing the accuracy of what an orbital actually is. An orbital is a mathematical description of the motion and position of the electron. The Bohr model works well for most high school chemistry courses, but if you teach periodic trends the need for subshells within an energy level emerges to explain exceptions to periodic trends. Whether we move towards orbitals or stick with the Bohr model we inevitably use lines to represent the energy of an orbital or energy level and arrows for electrons. We talk about how the line is higher when the electron tends to be further from the nucleus and how this correlates with higher energy levels. As light becomes absorbed the electron changes its state of motion into one of higher energy. Then the electron changes back re-emitting the same type of light (question 3). Look at all of the connections that the students in Figure 8 are capable of making. We can have a conversation about how varying frequency from radio light to UV light causes bigger and bigger changes in the molecules tested in spectroscopy and these students will easily relate. This poster has some ambiguities but there is a lot to like. The student is connecting the frequency of light produced based on the change in motion of the electron. The language of change is missing and it looks like the student thinks that faster electrons make higher frequency of light but there is a lot of knowledge there to revise and improve. This is a very challenging topic and I finish the unit by having students do a written reflection on what they have learned and are still confused about light. Before they do the final assessment I respond to several of these reflections in class to point out great observations and to refine some of the physics. Here are some of their responses. Student 1: I know that light is produced when the electrons in an atom are hit with energy and moves the electron to a different orbital on the atom that is higher than the one it was on. After this the electron falls back down to its original position and when this happens energy is produced in the form of visible light. Student 2: When an electron changes motion due to additional energy, it changes energy levels, moving up orbitals (s,p,d…). The higher the energy level, the light produced will approach violet on the visible light spectrum. The lower the energy level the light produced will be on the red side of the visible light spectrum. Student 3: Before my perception of light was that it was some kind of charged particle. To be honest, I wasn’t even very clear on what light was. On the day that we did the spectra lab, there was a bit more insight on how light was produced. I only knew that color appears by an object reflecting a color, but to produce a color without any initial light stumped me. I didn’t understand how light was produced or what light really was (like if it was actually a particle or some kind of energy?). I think on a 2d platform, the idea of light hitting the electron, stimulating it to move to a higher energy orbital and then falling back down to its original energy orbital, then making light is easy to comprehend. Bringing in the 3d orbitals are harder to comprehend and I don’t think I can visualize or completely understand the interaction from that perspective. Student 4: Light comes from charged particles (e-) and these charged particles give off light when they change how they move. Electrons move in a circle in different energy levels, these energy levels are different for every element. Overall, I learned more about what light is (electric field that is changing and is also a disturbance in the electric field). Student 5: Electrons move in different orbital states. S-orbitals move as spheres and p-orbitals move as lobes. Their movement creates an electric field around the nucleus. When the atoms shake, the electric field also moves creating light. Student 6: What electronic configuration is: A representation of electrons, as well as the amount of electrons, per energy level for a given element. Ex: Boron 1s2 2s2 2p1 On the first energy level, 2 electrons are moving in an s-orbital motion (spherical). On the second energy level, 2 electrons are moving in an s-orbital motion and 1 electron is moving in a p-orbital motion (lobe shaped motion). Student 1 does an adequate job explaining light absorption and emission but the word position should be replaced with the idea that each energy level or orbital description is of a state of motion not a location. Student 2 does a good job emphasizing that a change in motion is occurring but the description of what an orbital is could still be expanded. Student 3 does a phenomenal job of thinking about light and what they perceive and perceived about light in the past. I love the honesty and connections being made. Student 4 has a technically correct explanation and does a good job emphasizing the changes in motion. We don’t know that electrons move in circles even though the Bohr model uses that as a representation. Student 5 brings an interesting note up when they say around the nucleus. Really the light interacts with the nucleus and electrons as a system. When the electron changes its motion the nucleus changes as well but due to a larger mass the changes are ignored. Student 6 shows a strong foundation for what an orbital is and this could pay dividends for their understanding of light and matter interactions later.